Why Is My Tile Grout So Dirty? Tile cannot be more beautiful on floors, in kitchens, or in bathrooms. It provides a clean, yet earthy look to any room. The tile itself is easy to clean and generally needs low maintenance. However, many a homeowner has found that their tile grout may grow dirty as time goes on, and it’s not so easy to clean. Tile grout can become dirty in any area of the home. Soap, rust, and mold can mark grout in bathrooms. Dirt will seep into grout on a tile floor, especially in a high traffic area. Grout lining tile in a kitchen will become discoloured from soap and spills. How does this happen and can it be prevented? The answer is normal wear and tear, possibly a poor or worn seal, and yes, it can. Tile grout is a porous material, just like most natural stone. It will allow moisture, dirt, and any debris to seep into the stone if it is not quickly cleaned nor sealed properly. Like all surfaces, keeping tile grout clean is the name of the game. Removing dirt, excess moisture, and objects which may cause rust will keep your grout seal intact and lessen the likelihood that your grout will absorb dirt and moisture. Water damage can harm all natural stone and even grout, so repairing any leaks right away will keep your stones in their best shape. For everyday dirt and buildup, mixtures of vinegar (not safe for natural stones), baking soda, and even bleach can be used to lightly clean the tile grout. For stains and deep dirt, a professional tile grout cleaner may be required. Natural surfaces cannot tolerate acidic cleaners, so skip the vinegar with these. A solution of one part hydrogen peroxide and two parts baking soda is safe for natural stone. Using this mixture, you can scrub the grout lightly with a soft brush. Using the right cleaners for your surface is also critical. Harsh cleaners can damage a stain, or even the stone or grout material itself. Review the ingredients of all your cleaners, and ask a professional if you are not sure which cleaner should be used on each surface type. Porcelain tile grout may be cement-based and require a sealant, however, epoxy-based grout will not need a sealant. Epoxy-based grouts are used typically for natural stone. Note also that natural stone should be sealed prior to applying grout. Grout needs to cure entirely before being sealed, which will depend on which grout was used, but will normally need at least 30 days to cure. Since cement-based grout is porous, like natural stone, it needs to be sealed to keep dirt and other debris from staining the grout. 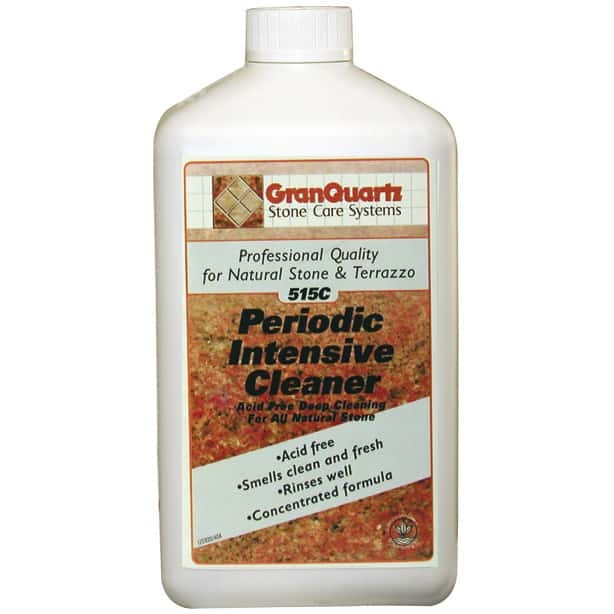 You will find that a number of home improvement and stone companies carry a tile grout sealant product. Some will be sprays for the entire tile area, while others may be liquids or pastes which are applied to the grout lines only. Note that the tile itself is already sealed and does not typically need an additional sealing when you are resealing your tile grout. Of course, if you are going to seal the grout yourself, be sure to fully clean the area and remove any dirt and stains in the grout before sealing, as you may seal the dirt or stains into the grout. If you notice that your grout is heavily stained, you may hire a professional to clean and reseal your grout. This will ensure you use the right cleaner and sealer to prevent future staining and get the most out of your tile grout. If you have natural stone, you also want the professional to gauge if the stone should be resealed before grouting. Treating your tile grout like a porous, natural stone may keep the majority of dirt, stains, and other damage out of your grout and keep the tile surface looking clean and new. However, from time to time, it will be necessary to reseal your grout. Evaluate the seal on your tile grout at least yearly, and reseal if the grout is allowing debris to discolour, stain and ruin the appearance of your tile surface.